Artificial intelligence (AI) technology improves the ability of brain imaging to predict Alzheimer's disease, according to a study published in the journal Radiology. Timely diagnosis of Alzheimer's disease is extremely important, as treatments and interventions are more effective early in the course of the disease. However, early diagnosis has proven to be challenging. Research has linked the disease process to changes in metabolism, as shown by glucose uptake in certain regions of the brain, but these changes can be difficult to recognize. "Differences in the pattern of glucose uptake in the brain are very subtle and diffuse," said study co-author Jae Ho Sohn, M.D., from the Radiology & Biomedical Imaging Department at the University of California in San Francisco (UCSF). "People are good at finding specific biomarkers of disease, but metabolic changes represent a more global and subtle process." The study's senior author, Benjamin Franc, M.D., from UCSF, approached Dr. Sohn and University of California, Berkeley, undergraduate student Yiming Ding through the Big Data in Radiology (BDRAD) research group, a multidisciplinary team of physicians and engineers focusing on radiological data science. Dr. Franc was interested in applying deep learning, a type of AI in which machines learn by example much like humans do, to find changes in brain metabolism predictive of Alzheimer's disease. The researchers had access to data from the Alzheimer's Disease Neuroimaging Initiative (ADNI), a major multi-site study focused on clinical trials to improve prevention and treatment of this disease. 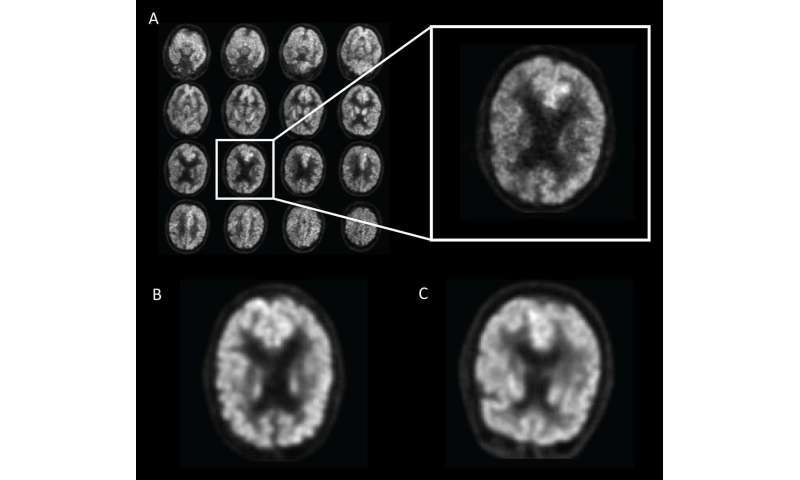 The ADNI dataset included more than 2,100 FDG-PET brain images from 1,002 patients. Researchers trained the deep learning algorithm on 90 percent of the dataset and then tested it on the remaining 10 percent of the dataset. Through deep learning, the algorithm was able to teach itself metabolic patterns that corresponded to Alzheimer's disease. "We were very pleased with the algorithm's performance," Dr. Sohn said. "It was able to predict every single case that advanced to Alzheimer's disease." Although he cautioned that their independent test set was small and needs further validation with a larger multi-institutional prospective study, Dr. Sohn said that the algorithm could be a useful tool to complement the work of radiologists—especially in conjunction with other biochemical and imaging tests—in providing an opportunity for early therapeutic intervention. "If we diagnose Alzheimer's disease when all the symptoms have manifested, the brain volume loss is so significant that it's too late to intervene," he said. "If we can detect it earlier, that's an opportunity for investigators to potentially find better ways to slow down or even halt the disease process." Future research directions include training the deep learning algorithm to look for patterns associated with the accumulation of beta-amyloid and tau proteins, abnormal protein clumps and tangles in the brain that are markers specific to Alzheimer's disease, according to UCSF's Youngho Seo, Ph.D., who served as one of the faculty advisors of the study. "If FDG-PET with AI can predict Alzheimer's disease this early, beta-amyloid plaque and tau protein PET imaging can possibly add another dimension of important predictive power," he said. More information: A Deep Learning Model to Predict a Diagnosis of Alzheimer Disease Using 18F-FDG PET of the Brain, Radiology, 2018.